Final ASP has quadrupled its hosting capacity thanks to significant investments in facilities, networks and systems infrastructure. Memphis, TN (PRWEB) June 29, 2010 -- Final ASP is pleased to announce that the company has quadrupled its hosting capacity thanks to significant investments in facilities, networks and systems infrastructure. With the expansion, Final ASP has doubled its networking speed with upgrades to its core network infrastructure. With the addition of hyper-threaded Quad-Core Intel Nehalem processors to its Virtual Data centers, the company has also more than quadrupled processing and virtual machine capacity. "While IT firms around the country continue to sell off infrastructure to stay in business, Final ASP is investing in new hardware in order to continue to provide our customers the benefits of the latest technology available today." "While IT firms around the country continue to sell off infrastructure to stay in business, Final ASP is investing in new hardware in order to continue to provide our customers the benefits of the latest technology available today," said Casey Condo, Final ASP president. Final ASP has also overhauled its backup and business continuity infrastructure with the addition of de-duplicated backups. This will increase restore and recover speeds for Final ASP's customers. Condo said the decision to make the new investment in infrastructure came after Final ASP reached 50 percent utilization capacity. As Final ASP continues to grow its customer base, the company made the move to faster servers and more capacity to provide current and future customers the best hosted applications and network infrastructure available. "We are constantly evaluating new technologies and products to add to our portfolio of services," said Mike Dawoud, Systems Engineer at Final ASP. "The new Intel Nehalem processors allow us to increase server density in our virtual environment while improving customer experience." Thanks to the new upgrade, Final ASP will also be able to increase its cloud computing offering, a key service for small and medium sized firms looking to outsource their data to the cloud. 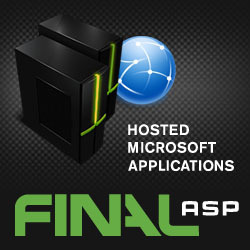 Final ASP is one of the first providers of hosted Microsoft applications and a market leader in outsourced applications and cloud-based infrastructure. Final ASP provides hosted Microsoft applications such as Exchange, Microsoft CRM, SharePoint, Office Communications Server, and Windows web servers. Final ASP also offers remote backup services as well as Virtual, Dedicated and co-located private servers running Windows or Linux. It is Final ASP's goal to be a turn key solution for all outsourced IT needs.